In the late 90's I started playing the Irish flute and quickly became involved with several Irish music bands in France. I spent many years playing in sessions and on stage and eventually decided to move to Ireland in June 2003. In 2005, based on my professional experience of woodworking and my passion of flute playing I decided to start making flutes. I sold my first flute 2 years later. I am a self taught flute maker and I am always learning more about the art of flute making and always trying to improve my work. 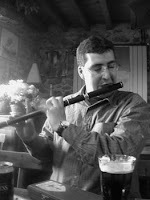 I make wooden flutes mostly for traditional music and more specifically Irish music. My flutes are based on 19th century English flutes such as Pratten, Rudall and Rose and Carte or Hawkes and son. I do not make exact copies of original instruments but I try to keep and improve all the characteristics most suitable for traditional music playing. My flutes are made using traditional methods as well as modern techniques. I mostly use the wood lathe for shaping and finishing and metal lathe for high precision tasks such as cuttings tenons or adjusting rings. Many of my tools are hand made and designed specifically for each model of flute I make. Flute making is not a full time job but more a passion for me, I have a day job and therefore I cannot produce a high number of instruments each year. Because I can only make a couple of flutes at a time, I tend to focus on each of them separately. Each of my instruments can be slightly different from, one to another as I constantly adjust my techniques and improve my skills. Once the manufacturing process is over I spend sometimes weeks tuning and trying each of my flutes to reach the best results possible. I would never sell a flute that I am not happy to play myself ! I do not make flutes for a living, therefore I have no necessity or interest in selling instrument at any cost. All the profit I generate by selling my flutes is directly used to buy wood and tools. I can now make flute in various type of woods and polymer such as Delrin, my flutes can have partially lined head (French head) or fully lined heads. I can add up to 6 keys ( long C, Bb, G#, long F, short F and Eb). I also offer various rings style options and screw caps. New flutes available, check it out ! !